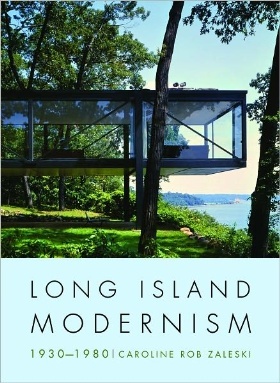 This book is an important historical account of the growth of modernism on Long Island and its impact and legacy to the broader American architectural landscape. It covers the work of many of the key figures of this period, Mies, Meier, Johnson to name but a few, delving into their production process, the relationships they would forge with clients and others ranging from artists to politicians. Their work is catalogued in over 300 images; many period photographs by the American photographer Ezra Stoller and more recent photographs. The book also contains a wonderful array of original sketch, hardline and presentation drawings. Today around 30% of the 501 buildings documented exist in their original form; the remainder have been seriously altered or demolished. The author also attempts to explain the migration of Bahaus teaching, it’s Americanisation and the resultant work on Long Island and its influence on teaching in American architecture schools. Zaleski writes in an anecdotal manner, with emphasis at times placed on the client’s perspective, their circumstances and how this impacted upon the outcome of the architecture on display here. Reading the book one comes to the conclusion, that the notion of modernism, in this case the Long Island version of modernism, may still be relevant today. The high ideals of the architects, combined with a poor economic background and a desire to find contextual identity through vernacular materials, poses as many questions as the book attempts to answer. One such question being; if architects in this era could achieve so much, why can’t we? The event itself was fun and very indulgent. The Tasting House comprised of seven rooms, in each room a theme; British, South Pacific, Mississippi etc. These themes represented the seven new varieties of sugar Tate and Lyle had created. The treats on display were prepared by @FancyNancyCakes and was the work of 14 bakers, spending circa 2100 hours baking and 900 hours decorating! Almost everything in each room was edible, it goes without saying that this was brilliant…..even if it hinders the waste line for a period. Tate and Lyle’s “Tasting House” by @WeLoveBaking at 68 Dean Street, Soho, London, W1D 4QJ was a treat not only for the taste buds but for the eyes too. Great taste and great craftsmanship. Safe to say that the Tasting House would be the only nefarious activity I would endorse in Soho!